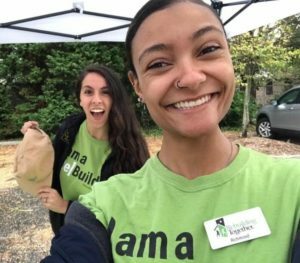 Our Operations Admin and Executive Assistant, Tianna volunteered with Rebuilding Together Richmond (RTR) one rainy Saturday this month. The organization hosted their annual “Fall Fix-Up Day” in Petersburg to help repair homes and clean up trash around the area. This day is similar to RTR’s “National Rebuilding Day,” which is a full day of home repairs and community revitalization in the Spring. Tianna helped by managing their social media for the day. She was able to take pictures and videos, create posts and interview with volunteers and homeowners.